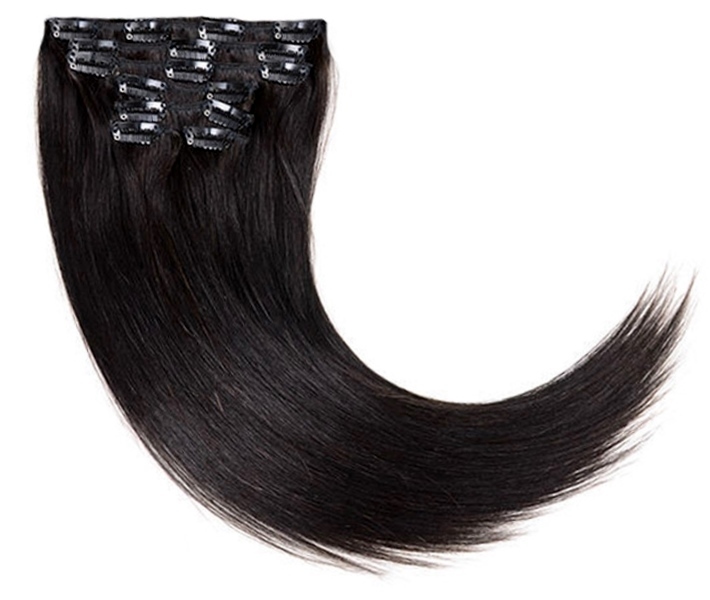 If you're into trying new things, then black clip in hair extensions might just be the clip in hair extensions for you. The great thing is that black can be worn by all skin tones and if you're lighter in complexion then an off-black or brownish-black colour will ensure that very pale skin doesn't appear paler and our hair extension colour and skin tone guide has more details. You can also choose to go for hair extensions that start of black and then change towards the end as either ombre colours or dip-dye looks. Black clip hair extensions are available as single wefts ranging in width from approximately (1 inch) 2.5cm to be used at the temples; to 9 inches (23cm) which go across the back of the head (ear to ear). In addition to the different sized clips, the larger clips are also available in different densities so you have the choice of buying a single 9” piece that weighs 100g or 9” piece that weighs about 35g (you can check out images of this here). Silky Straight clip in hair extensions are also available in multi width sets which usually start at seven piece sets and can increase to 12 piece sets and again come in varying densities (weights). If you’ve read any of our other articles on clip in hair extension textures, then you’ll know that clip in hair extensions are widely available in lengths between 8-28 inches. If you've really read any of the articles, you'll also know that there slightly longer lengths available but you’ll have to get out your magnifying glass as they can be hard to spot. As always you can use our wigs by face shapes guide for the lengths that suit different faces. 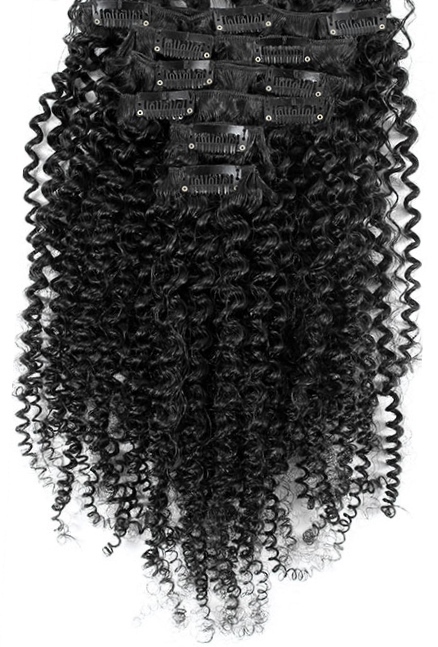 Clip hair extensions are available in remy and non-remy versions. You can read a more extension guide to clip in hair extension care in the Caring For Clip In Hair Extensions Guide or you can whizz through these five tips to keep your black clip on hair extensions in beautiful condition. 1. If you have textured clip in hair extensions (wavy or curly) use a leave-in conditioner or deep condition after washing with a shampoo for chemically treated hair. 2. If you have textured clip in hair extensions then it's better to limit the use of heat straightening tools as frequent use can permanently distort the texture. 5. Dry the hair in an upright position so that any waves or curls return and that straight hair doesn't have any unnecessary kinks. Righto, that's the bolt through black clip in hair extensions but there's more information in the Hair Extension Q&A section as well as the navigation menu; or if you'd like to keep up to date with the next guide about hair weave, hair extensions, wigs and hairpieces then join our blog – no personal info required.